1. Let them express themselves! If they want a super-bright color on their walls that you might not choose, don’t fight it. Paint is inexpensive, and it’s a small price to pay to give your teens a bit of the independence they crave. They really want to make some of their own decisions, so let them go bright and bold! You can help make sure the paint isn’t ghastly by picking a lighter shade of the color and then punching up the volume with fabrics and other elements in the space. 2. Try something different. A teen’s space can be a fun place to experiment with design, so push your boundaries a bit. I put a cool “denim” finish on the paint in the room above, and then outlined the ceiling in red and blue stripes that remind me of a varsity or prep school look. It gives the room a great vibe. 3. Make it multipurpose. Give them zones in their rooms that allow them to have a lot of activities in that one space. 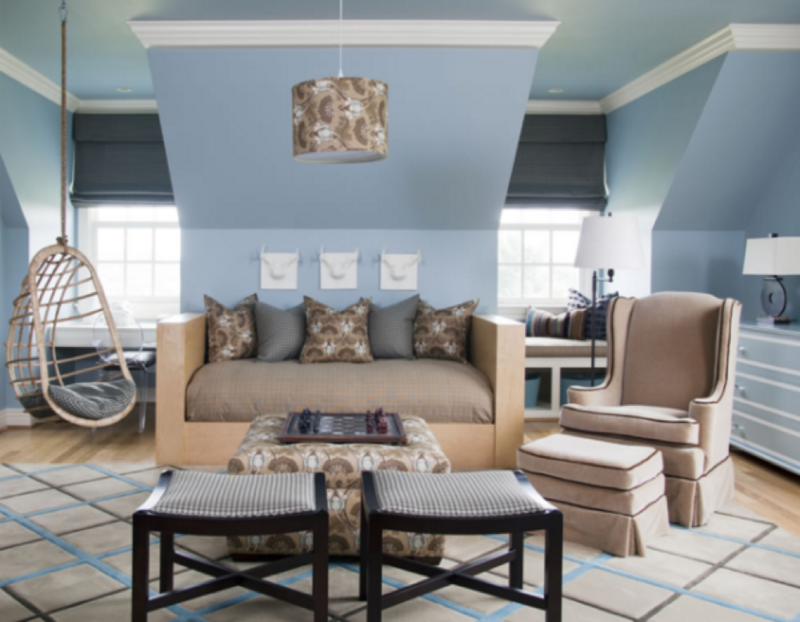 In this former attic, the dormer works for the bed but looks like a sofa or daybed—a great place to hang out. And consider other zones like a homework station, a seating area, a music area, a gaming zone—whatever fits their interests and the amount of space in the room. Call on multipurpose storage, too, like the ottomans I used above that can be converted to tables with storage inside. 4. Go for function. Teens have a lot of stuff—especially a lot of electronic stuff—so be sure you have lots of plugs, USB ports, storage, and lighting. You can add all this function and still pull off a look or a theme like this fashionista teen room. And maybe with all that storage, the room can stay clean most of the time. Fingers crossed! 5. Add some fun! 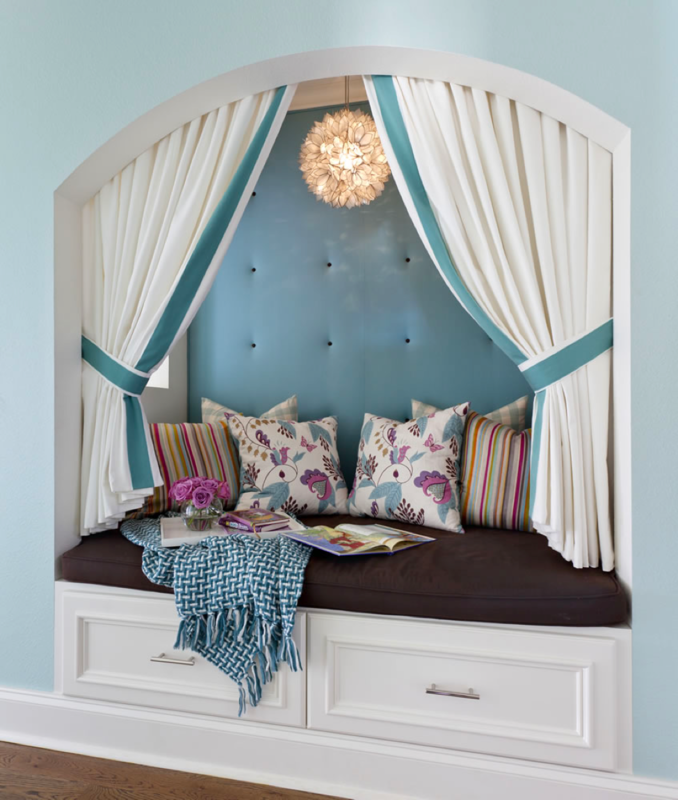 A hanging chair or some whimsical details can really take a teen room over the top—and give them some fun along with the function. It makes teens feel important and heard when you add elements that are a bit out of the box but were top of their “dream room” list. 6. Me time. But the best thing you can do for teens is to give them a bit of an escape from the world—a place where they can get away and feel comfortable. After all, isn't that what we all want in our homes?